The Aesthetic for Calaveras first began appearing around the 17th century but has had roots in Aztec, Mayan, and Toltec cultures. Calavera directly translates to skull but has a certain style differing from the style more prevalent in American like Gothic, Biker, or Pirate themes. It stems from not only honoring the dead but creating humility in ourselves by reminding us of our own mortality. The featured image is La Calavera Catrina by Jose Guadalupe Posada and is the basis for how the style of a Calavera should look. Many forms of Calaveras appear in the form of painting, face paint, and even sugar skulls that all hold similar attributes to Posada’s. The sugar Calaveras are shown to be more colorful to embrace the good memories of one’s life. They are made from sugar and topped with icing, but can also have other objects as seen in the pictures above. 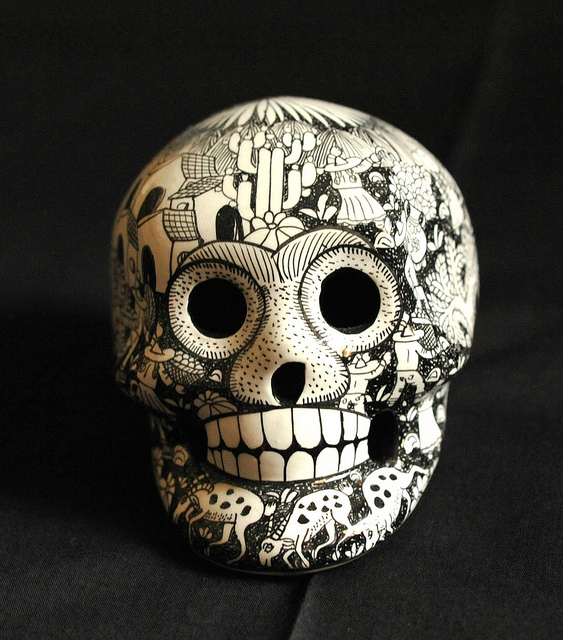 Some people even take this concept to painting their face in a Calavera design as seen below. They also make clay versions of the Calaveras which were used back in Aztec celebrations of Dia de los Muertos. The culture surrounding Dia de los Muertos is very rich and greatly impacts how homes look year long and teach a more lighthearted acceptance of death. I definitely found this to be a really cool aesthetic that you chose to learn more about. Does the aesthetic design require attributes to be considered Calaveras? Whenever I see the sugar skull with the brightly colored details I immediately think about Dia de Muertos, and I really did not know that this aesthetic was used beyond the celebration. I like the different images that you decided to attach and I think it gives a good representation of the different styles in Calaveras. I would love to know more about the applications of this aesthetic. Can you design something that is not a physical skull and apply similar decorations or does this have to be specifically a skull in some form? Great post! Joseph, Excellent choice for your aesthetic exploration, I agree with you that “Calaveras” are beautiful. I am from Mexico City and I really enjoyed your background section. I think its essential to mention “Calaveras” pre-Hispanic roots like you did. I also liked that you talk about the “Dia de Muertos” celebration. Great work.